I’m sure I’m not the only millennial Celtics fan getting feelings of nostalgia while watching the C’s in a first-round playoff series against the Pacers. Older fans might not hold onto these memories as closely as we do because they were spoiled with 16 NBA titles from 1957 to 1986. But for us, a significant portion of our childhood was spent watching Paul Pierce, Antoine Walker, Ricky Davis, and company go against Jermaine O’Neal, Ron Artest, and an aging Reggie Miller in the Eastern Conference Quarterfinals. Thrilling stuff, I know. Boston and Indiana met in the first round in three consecutive seasons from 2003 to 2005, and all joking aside, a couple of those series’ actually produced some memorable moments. Before we get into the glory days of the early 2000’s though, we’ll go back to the beginning of the playoff history between the Celtics and Pacers in an era that old-timers might remember more vividly. The tail end of Larry Bird’s legendary career. Even with Bird’s showing in Game 5, the Celtics’ best player during that series was 25 year-old Reggie Lewis. Lewis continued to emerge the following season, making the ‘92 All-Star team and leading the C’s in points per game with 20.8 on 50% shooting. He also led in blocks and steals. Bird continued to break down in ’91-’92, playing just 45 regular season games and missing the first playoff series in what was his last NBA go-around. On the bright side, his absence gave Lewis a chance to shine even brighter. Unfortunately I couldn’t find any footage, but Reggie led the C’s to a first-round sweep of the Pacers while averaging 27.7 points per game. After Lewis led them past the Pacers in 1992, the Celtics wouldn’t win another playoff series for 10 years. The biggest reason for that drought was Reggie’s tragic death in ‘93 at the age of 27. When you combined that with Len Bias’ passing in ‘86 and Bird’s early retirement, the C’s weren’t left with much to work with in the 90’s. Guys like Dee Brown and Dino Radja did their best to keep the team afloat, and even a 35 year-old Dominique Wilkins was given a shot to contribute. Then young Antoine Walker became the face of the struggling franchise for a couple seasons before Paul Pierce was drafted in ‘98 and ‘Toine was demoted to second fiddle. It took them four years, but the Pierce and Antoine duo was eventually able to get the Celtics back to the postseason. An improbable Eastern Conference Finals appearance in ‘02 began a new era competitive basketball in Boston after a decade-long hiatus. The 2003-04 season was a mess. Jim O’Brien resigned and Antoine Walker was traded to the Mavericks in a deal that brought in the elite talents of Raef Lafrentz, Jiri Welsch, and Chris Mills. Pierce’s new sidekick became Ricky Davis, who was acquired in a trade that sent Tony Battie, Eric Williams, and Kedrick Brown to Cleveland. The C’s finished 10 games under .500 but still managed to make the postseason in an embarrassingly weak Eastern Conference. The Pacers swept them in four lopsided games. Celtics basketball briefly became interesting again in 2004-05. Doc Rivers took over as head coach, and veteran Gary Payton was acquired in the offseason then traded to the Hawks at the deadline in a package deal that brought back Antoine Walker. Payton was then waived from Atlanta and picked up by the Celtics again one week later. Pierce, Walker, Payton, and Davis managed to lead the C’s to the three seed in the East, but they fell to the six-seeded Pacers in seven games in the first round. Reggie Miller was 39 years old and in his last season, but he dropped 28 points in a Game 2 win and 33 points in a Game 3 blowout in Indiana to take the series lead. The Celtics responded with a 110-79 thrashing in Game 4 to tie things up, behind 30 points from Pierce and some excellent team defense. The Pacers destroyed the Celtics by 27 points in Game 7, and that would be the last time Boston saw the playoffs until Kevin Garnett and Ray Allen arrived. Now in a whole new era, these two teams meet again in the opening round. 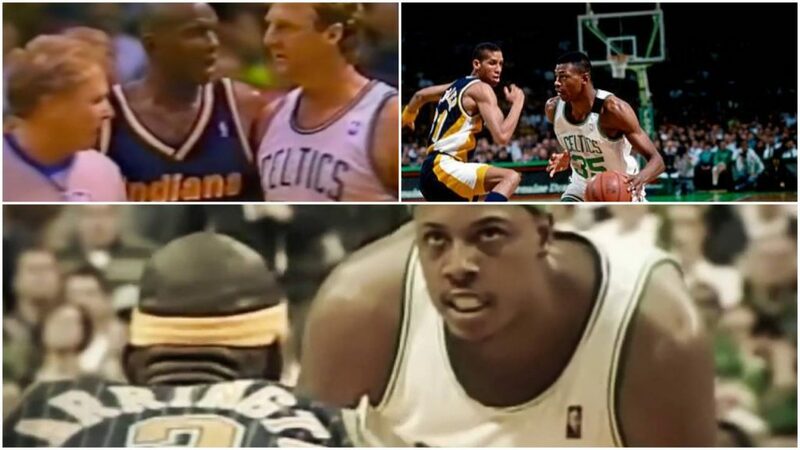 The Celts have won three of the match-ups dating back to ‘91 and the Pacers have won two. Already up 1-0, the C’s shouldn’t have too much trouble handling Indiana this time around. Without Oladipo, they don’t have any O’Neal, Artest, or Miller-level talent to worry about.